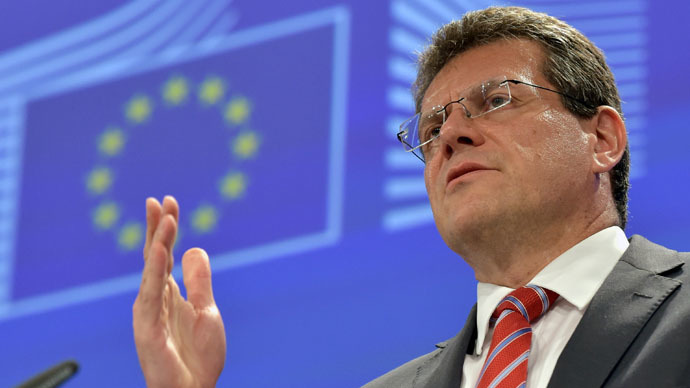 Russia's refusal to pump gas through Ukraine will change the balance in Europe, which will have a negative impact on the energy security of Europe, said European Commission Vice President for Energy Union Maros Sefcovic. "If you look at the construction and plans of gas pipelines, one of the goals is to make the Ukrainian transit system less relevant, or to cut off supplies through Ukraine completely. This would have very negative consequences for energy security in Europe, because the Ukrainian transit is very important, it is the largest, at 140 billion cubic meters per year,” said Sefcovic speaking to journalists on Wednesday. He said that if the purpose of the Turkish Stream project is to gradually empty the Ukrainian transit route, it is unacceptable for the EU, as it will change the balance of gas in Europe. It will put the countries of Central and South-Eastern Europe in a very difficult situation, he added. In July, the President of Ukraine Petro Poroshenko said the agreement between Russia and Ukraine on gas transit to Europe would be prolonged after 2019, when the current transit contract expires, as there is no alternative to the Ukrainian route. Russian Energy Minister Aleksandr Novak and Gazprom CEO Aleksey Miller have repeatedly said that Russia does not plan to renew the contract for gas transit through Ukrainian territory after 2019. However, at the end of June Russian President Vladimir Putin instructed Miller to hold talks with Ukraine on the extension of the transit contract. Ukraine’s Naftogaz wants to raise the rate of transit from the current $2.70 to $5.00 per thousand cubic meters per 100 km, which is unacceptable to Russia. Turkish Stream is intended to reduce gas transit through Ukraine. The 1,100 km pipeline that will have four lines and an annual capacity of up to 63 billion cubic meters (bcm) of gas. About 16 bcm will be supplied to Turkey; the remaining 47 bcm will go to a hub on the Greek - Turkish border, where the gas can be transported onwards to Europe. However, the project has been facing difficulties. Last week Gazprom decided to sever an agreement with Italy’s Saipem as the major contractor, just as construction of the first part of the project under the Black Sea was about to start. The termination would not affect the construction schedule, as it is a technical issue, Russian Energy Minister Aleksandr Novak said. In addition, Russia had planned to sign an intergovernmental agreement with Turkey on the project by the end of June, but it never happened. The new Turkish government hasn’t yet been formed after the parliamentary elections in early June. Turkish gas company Botas is expecting a discount from Gazprom, and is threatening the Russian company with court action if it doesn’t get it.